The City Council Thursday approved Bloomberg's plan to transform the Queens industrial zone into a glitzy realm of 5,500 housing units, retail stores, a hotel and a convention center. The borough is Queens. Flushing to be exact. 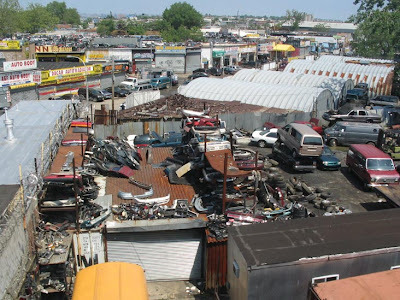 The place is Willets Point, known by locals as "The Iron Triangle". If you've been there, then you know. It's right across the street from Shea Stadium. It's a labyrinth of dirt roads, auto repair shops and scrap yards. There are no sidewalks or sewers. When it rains, it floods; it floods real bad. Wild chickens roam free, wolves howl with a smokers cough and pigeons named Chavez walk around smoking big Cuban cigars. It's like nothing you've ever seen. 1- You're having trouble finding parking on opening day at Shea and it's already the top of the 2nd on F-A-N.
2- You're looking for a passenger window regulator for your cousin's 1987 Toyota Tercel. It's sort of an unspoken thing that if you can't find on-street parking for a Mets game (and when can you ever find on-street parking for a Mets game) you can pull into the labyrinth of dirt roads of wild chickens if you dare and park your car in front of Gomez Auto Body for $10. 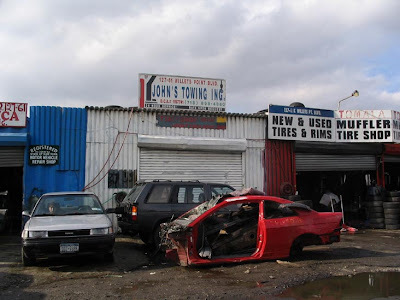 And there's a pretty good chance your car will be there after the game if it hasn't been stripped and sold for parts. Sadly, plans are underway to replace this unique area with a sustainable and affordable mixed-use development including a convention center and 5,500 units of housing. The plans include environmental clean-up and business relocation. 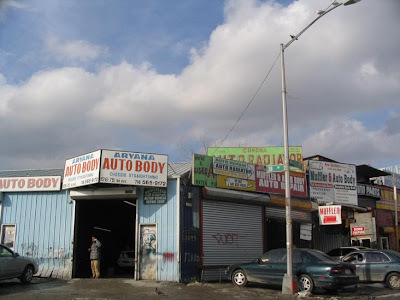 On May 1, 2007, Bloomberg announced new plans for urban renewal in the area, calling Willets Point "another euphemism for blight." I guess he never had trouble finding parking or an alternator for a Datsun 720. What a load of crap, losing the Iron Triangle that is. I've gone for bike rides there, the pot holes are as deep as kiddie pools. Don't get me wrong I love the Mets but this is ridiculous, they nor the city should have this much power. There are businesses there that serve a nitch, and Bloomburg and the Wilpons are throwing them in a ditch. Fat Cats lickin their paws, leavin all of us nothin but hairballs. Looks like a slum in Mumbai or a Rio favela. I say keep it the way it is. Cheaper than a passport and airfare.